Well you could, but you shouldn’t. DIRECTV SWM technology is pretty amazing. It allows you to watch any of thousands of channels on a single wire while using inexpensive splitters to wire your home instead of running a wire from each receiver straight to the dish. It’s revolutionized satellite TV as we know it. Most people opt for a satellite dish with SWM technology built in, but for folks who want a ton of receivers (or for business customers) an external SWM multiswitch is the way to go. 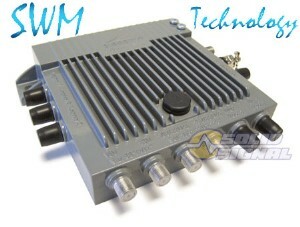 They should not be used for SWM multiswitches, at least not unless they have built-in fans. DIRECTV SWM multiswitches can reach temperatures of 140 degrees on the outside of the case and they rely on good airflow to keep them healthy. That’s part of the reason they have big metal cooling fins on them. Putting them inside a weatherproof enclosure is one sure way to kill them off, because it will get really, really hot in there really, really fast. Any enclosure designed for this kind of technology should have fans and ventilation and be big enough for good airflow. Otherwise, you’re going to have yourself one fried SWM very quickly.